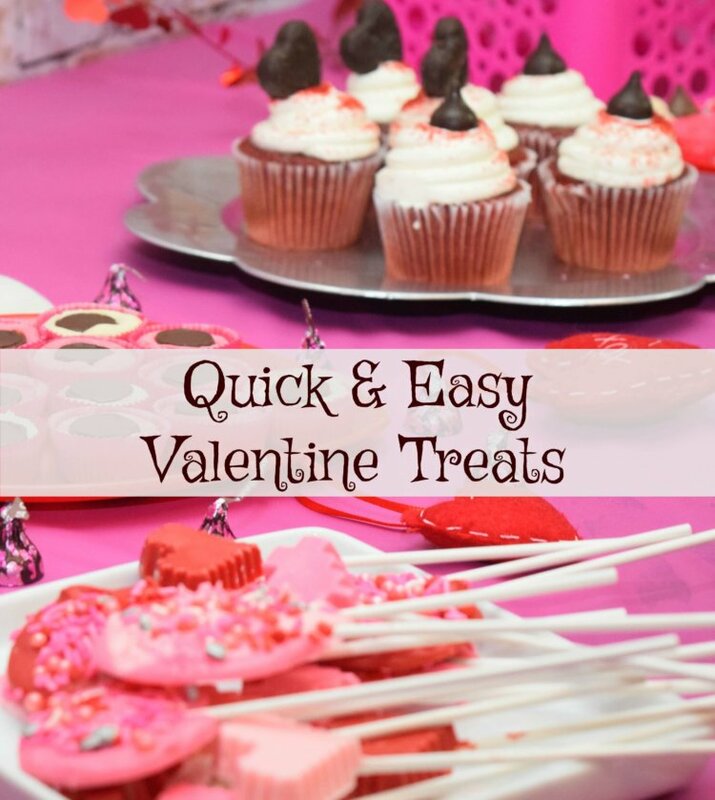 You want to make some Valentine treats to share, but you want them to be easy, right? Well, I’ve got two ideas you’re going to love. 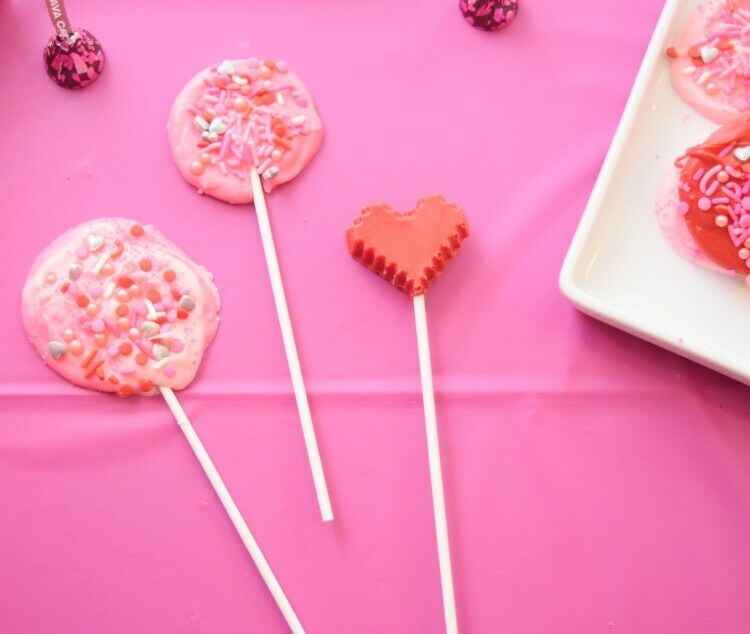 These are perfect to bring to work to share or take to the kid class Valentine’s Day party! Buy chocolates in heart shapes. Top pink, red, purple, or white cupcakes with a heart chocolate. You can even add a touch of color to the cupcakes. I used heart-shaped York peppermint patties as well as Hershey’s Lava Cake Kisses to top my cupcakes. 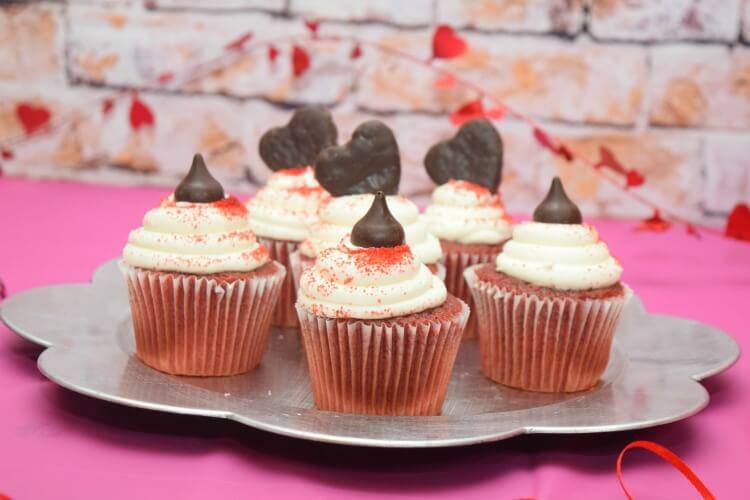 If you can find red velvet cupcakes, topping them with heart chocolates looks amazing. They sell them as 4 packs at Walmart. This is literally the easiest thing ever! Lay out a piece of wax paper on a cookie sheet. Have your lollipop sticks and sprinkles ready to go. Melt the candy melts in the microwave in a microwave-safe bowl for 30 second increments, stirring after each time. When they are completed melted, transfer to a zipper baggie. If you’re fancy, add a spoonful of each color to one baggie. Snip off a corner of the baggie and then twist the other side to make it like a frosting bag. 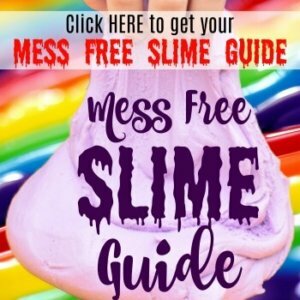 As you squeeze out the candy melts, swirl in a circle. Make sure to cover the lolliop stick about 1/2 to 1 inch or so. Once you’ve filled the cookie sheet with lollipops, pop it in the freezer for 10 minutes. When you remove it from the freezer, gently peel the lollipops off the wax paper. Eat immediately or package them up pretty for a Valentine’s Day treat! In addition to the freehand circle lollipops, and I also used a pixelated heart candy lollipop mold that I found on sale. 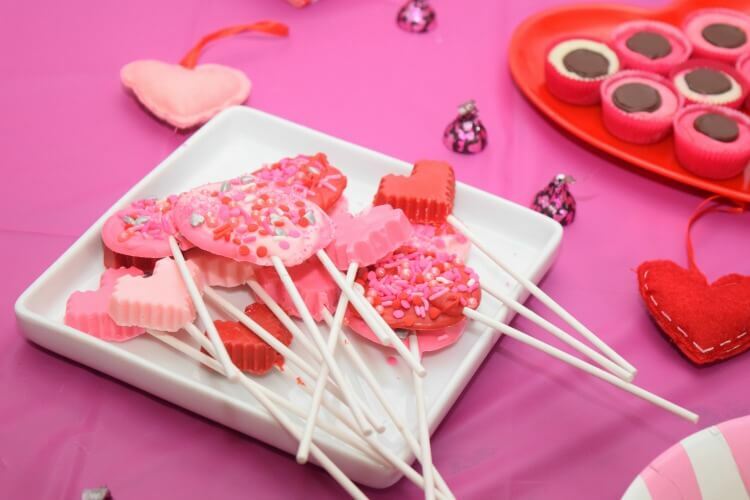 These both are such easy treats to make and perfect for the Valentine’s Day party spread.